With funding from The McKnight Foundation, PAM worked in four Minneapolis neighborhoods—Cedar-Riverside, Elliot Park, Logan Park, and Whittier—to engage community members in identifying social and cultural heritage assets, and implementing new ideas for place-based community revitalization. While traditional historic preservation typically focuses on architectural styles and historical associations, cultural assets also include the intangibles that define neighborhoods—places, yes, but also people, businesses, stories, and traditions. Their aim is to empower community members in organizing to identify, preserve, and maintain these assets, increasing neighborhood vitality. Peg McQuillan Porter and her husband, Al Porter, sat down with me in the front porch of their home on a warm October evening. Neither Peg nor Al had spent much time in Logan Park before shopping for a house here last winter. Choosing a house can be a weighty process, where one logically considers price, school districts, safety, and proximity to one’s work. But as we do with other important decisions, we often abandon reason at the last minute and give the final call to our gut. 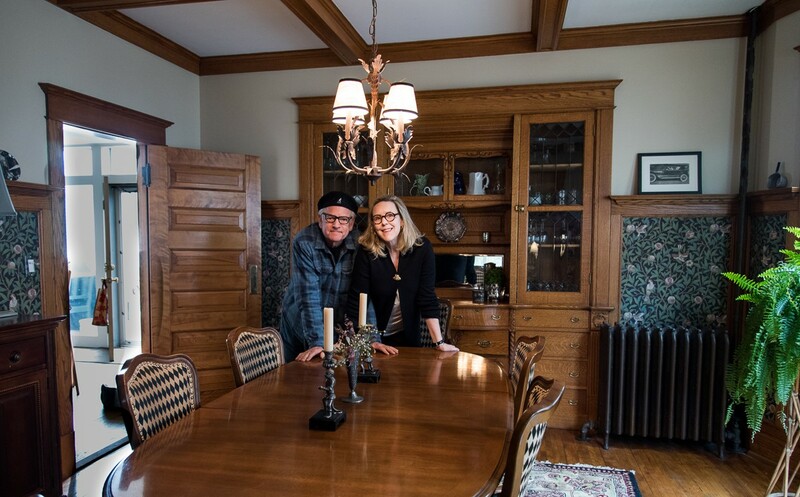 When the couple drove down Logan Park’s tree-lined streets, past the quaint homes, and around its park, it was difficult not to feel that it-factor. The feeling only intensified when they walked into 1319 Adams Avenue NE. “We felt at home. Right. Away,” Peg said affirmatively. The emotional process of parting with a beloved object is no different than acquiring one. Peg and Al knew theirs was one of several offers on the house, so they wrote the sellers a letter promising to “fill her with books and music, and to respect and love her.” The former owners valued that shared commitment, and sold the home to Peg and Al. As I walked through their home with them, it appeared that they had made good on their word. But I discovered their commitment to place extended far beyond the walls of 1319 Adams. In February, they started attending meetings about Logan Park’s comprehensive plan. In April, they actually moved in to their house. Peg emphasized their desire to be part of the neighborhood. The screened-in front porch holds a special place for Peg and Al. There, they can see and be seen. They can wave to their neighbors, develop routines and regular relationships. They repeatedly professed a desire to be visible and active community members. The porch facilitates these nodes of connections. A few weeks before we spoke, Al answered the doorbell and found an older woman standing in front of the house. Her name was Sue Adamek; the house had been built for her grandfather in 1906 and her father was among its first inhabitants. Would she like to come over for dinner sometime? Sue’s grandfather, Chas Lebeck, came to the United States from Sweden in the 1880s, moving to somewhere near Ashland, Wisconsin to fell trees. He married Hanna Turner, a woman from a nearby village in Sweden, at a Swedish Lutheran church on the north side of Minneapolis in 1885. He then began working for Bardwell Robinson, sash-and-door manufacturers, and later, the H.S. Johnson Company as a construction foreman. 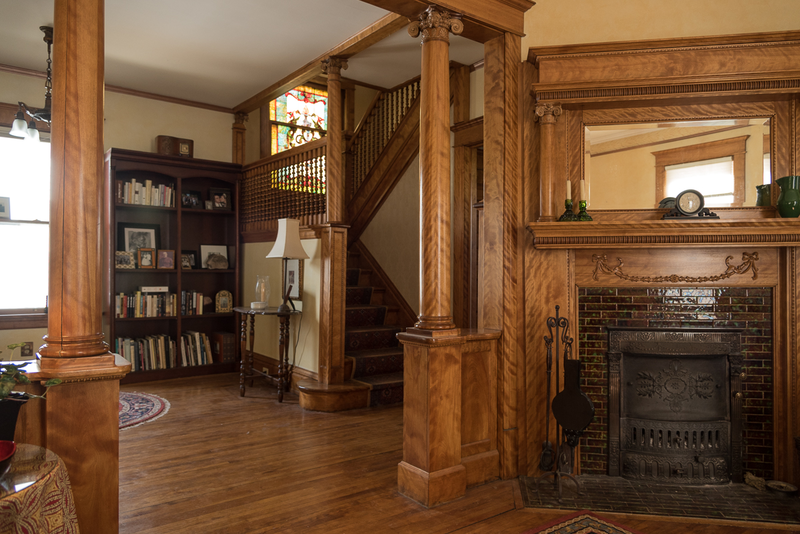 She doesn’t know who actually built the house for him, but suspects his connections within the industry gave him flexibility in its design and control over the tremendous quality of the woodwork. He and Hanna lived in the house with their three children, including Carl, Sue’s father. Carl remained until he started at the University of Minnesota in 1920. Her uncle Roy and grandmother remained on Adams Street until she passed away in 1953. Sue would go to her uncle and grandmother’s house for special occasions, and fondly recalled eating her grandmother’s rice pudding, the beautifully polished wood throughout the house, learning how to make hollyhock dolls from the trees planted by the house, sitting by the coal-burning fireplace, her Grandma’s English—strong, but with a thick Swedish accent. They had a television fairly early on—or at least earlier than her own family had a television—and an icebox. Her grandmother did not want to get a telephone because “she was afraid she’d spend all her time on the phone talking all day because people would be calling her constantly.” But her grandfather insisted upon it, both as a business practicality and because “he also wanted to be sure that things were American in their home.” They never spoke Swedish around the house, and he always made sure to vote. Sue recounted stories from her father about how her grandparents offered their home to recent immigrants from Sweden and helped them find their footing in their new country. Those new-arrivals often filled all the cots lined up on the unfinished third floor. A legacy of commitment to community runs from the house’s origins to the present day. As does an appreciation for detail. Peg guided me into the dining room and admiringly pointed to the sliding doors with polished oak on one side and the maple on the other. “Who does this anymore?”, she exclaimed. Part of Peg’s immediate attachment to the home is its age—the craftsmanship, the warmth, the intangible sensation of memories imbedded in the woodwork. The simple feeling that they exist adds to the place’s appeal. It makes them feel like they’re contributors and participants in 110 years of history. That desire for a connection to the past and present is built upon the same fundamental values: a commitment to being part of something bigger than yourself, a sense of obligation to community. Our conversation turned to the gentrification of Northeast. I asked these new residents about their opinions on the polarizing subject. Peg remarked she doesn’t want the area gentrified, she just wants it cared for. To her, gentrification means no teardowns, rehab of existing properties, no fanciness and elaborate buildings, no developers that will only lease to safe tenants like chain businesses. It means preserving the places which support—and have supported—community. The deep history baked into homes like 1319 Adams and the old brick warehouses here provide a build-in infrastructure for connection to place, and, as Peg and Al found out after meeting Sue, people, too.